Workers from BA Murphy Constructions discuss strategies to avoid heat-related illness while doing physical work in hot conditions. Businesses must do everything that is reasonably practicable to eliminate the risks to workers’ health and safety, including those associated with working in heat. This may include cancelling certain work tasks, rescheduling tasks to cooler parts of the day or waiting for hot conditions to pass. 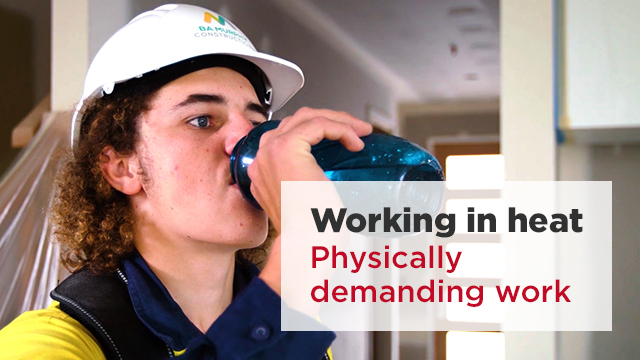 Managers and supervisors should regularly check on their workers to ensure they aren’t suffering from any heat-related symptoms and are keeping hydrated while working in heat. For further information on how to manage the risks of working in heat see the Guide for managing the risks of working in heat. Chris Lawther: I’m not originally from Queensland so you notice a difference in humidity and temperatures. Kristina Kucan: Within our company we run Toolbox Talks. These are the forums that our workers bring issues up. So, they may raise to their supervisor an issue. If there is hot weather forecast, how will they manage this? How will they plan their works? What can we do better as a business? And what have we done well in the past that we can replicate to our other sites? Chris Lawther: Heavy work, physical work that needs to be done, we’ll always do that in the beginning of the day, the cooler hours of the day. And we also use machinery where possible. And once it gets too hot we’ve got the light duties. Jai Cooper: When it’s been a really hot day and I’m doing really labour intensive work, you do start to feel a toll. As an apprentice, they always do check on me, asking me how I’m doing. Chris Lawther: Yeah, if people are fatigued, their concentration starts to dwindle. They make mistakes and things go wrong. There’s no restrictions at all on hydrating yourself, or if you’re feeling a bit hot just go and cool down and you get back into the job and get things done more efficiently. Kristina Kucan: It’s about learning and educating our workers as well as our subcontractor base.